Clare Tarplee of St Coca’s has dropped out of the team for the European Team Championships in Finland this week. Emma Mitchell of QUB will drop down to the 1500m, with Riocht’s Shona Heaslip coming into the team and running the 3000m. 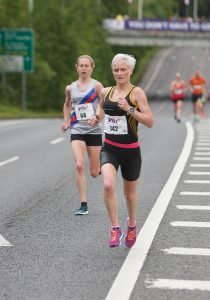 Anne Marie McGlynn of Letterkenny will run the 5000m. Meanwhile, marathon trio Mick Clohisey of Raheny, Rathfarnham’s Sean Hehir and Leevale’s Claire McCarthy head for Wales to run the Swansea Half Marathon this weekend. All three are in training for the World Championships in London next August.